I had been to Shiraz 35 years ago on business, and I really looked forward to my return of this historic city. I must say, however, that what I saw was a city whose glory days are mostly in the past. The city looked old, with few new buildings. While we were there in February, I saw none of the roses that used to be planted along every major street. Famed, pre-revolution for its wine, vineyards now export the grapes to France as production as well as consumption of all alcoholic beverages is strictly forbidden. While the bazaar and historic sights remain sights worth seeing, preservation efforts to me seemed to lag behind other cities visited. Here's what wikipedia.org has to say: Shiraz - is the sixth most populous city in Iran and is the capital of Fars Province. Shiraz is located in the southwest of Iran on the Rudkhaneye Khoshk seasonal river. Shiraz has a moderate climate and has been a regional trade center for more than one thousand years. 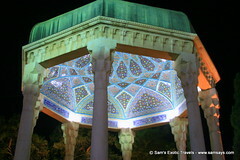 Shiraz is known as the city of poets, wine and flowers. It is also considered by many Iranians to be the city of gardens, due to the many gardens and fruit trees that can be seen in the city. 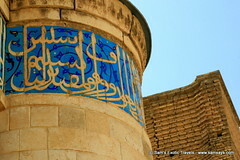 Shiraz has had major Jewish and Christian communities. 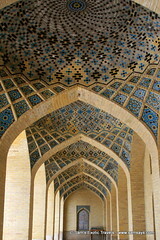 The crafts of Shiraz consist of inlaid mosaic work of triangular design; silver-ware; pile carpet-weaving and weaving of kilim, called gilim and jajim in the villages and among the tribes. In Shiraz industries such as cement production, sugar, fertilizers, textile products, wood products, metalwork and rugs dominate. Shirāz also has a major oil refinery and is also a major center for Iran's electronic industries: 53% of Iran's electronic investment has been centered in Shiraz. Shiraz is home to Iran's first Solar Power Plant.